Rumored to be the only five master on the Great Lakes, the David Dows was launched from Toledo, Ohio with a wieldy 265 feet in length. 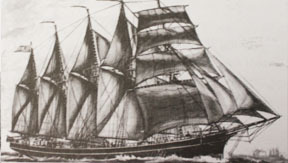 Often said as the largest schooner on the Great Lakes at the time, her owners found her often too large for regular service. With that, much of her service was as a barge that was towed. A short 8 years after her proud launching, she was being towed and her back was broken while attempting to cross an area of large waves. The Dows succumbed to her damage and went down that day. Initially, after sinking her masts still breached the water line and were a serious hazard to navigation until winter ice broke them off. In 1908 her hull was partially removed. Despite this, the David Dows still remains as amazing shipwreck to dive and explore. With her relatively shallow depth of 40 feet, she is a treat for divers of all skill levels to dive. We visit the David Dows from Hammond Marina.